Condition: Used. Minor dings on the box. Everything is fine inside. All expansions inside main box. 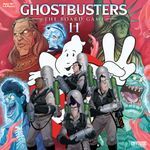 Sweeteners: Ghostbusters: The Board Game II – Louis Tully's Plazm Phenomenon. This edition comes in the white box.